For such a long time, I was convinced that a capsule wardrobe would save me so much time and money. I think it does for many people. 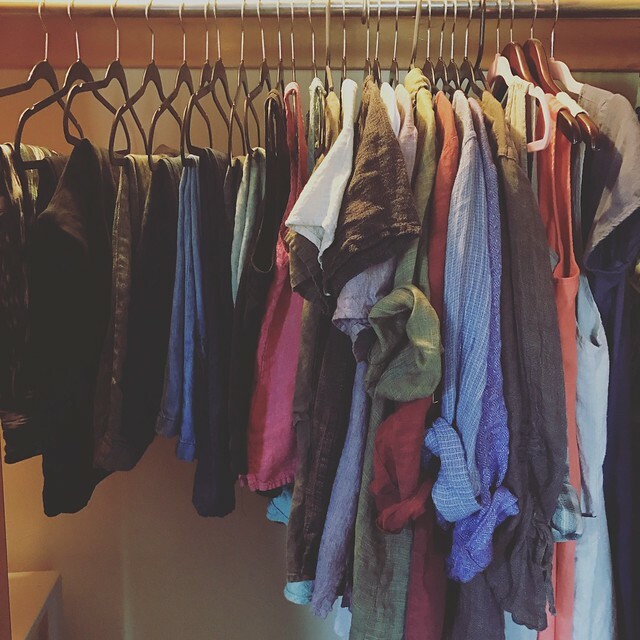 For years, I weeded my clothing down to just 25 items or so every spring, summer, fall, and winter. I felt a lot of pride looking into my bare closet. I felt like I had such control and so many options. The thing is, I grew tried of constantly giving so much attention to my clothes. I work from home, after all, and sometimes I just stay in my lounge outfits all day. That's a luxury I know not everyone has. But in my life -- right now -- it doesn't make sense. One day, it dawned on me. What I really needed to do was to stop buying clothing altogether. That's the root issue here. After all, when I was searching to create a perfect capsule for any given season -- I'd inevitably find gaps. And I'd need to fill those gaps with almost a laser focus. So, I've stopped doing that. What have I done instead? Well, being pregnant twice in recent history has been tricky when it comes to clothing. I can't give a full tutorial on best practices if your body isn't constantly changing. I have several pairs of maternity jeans and shorts and flowy shirts. I've been sticking to those. I did buy a few new pieces with this last pregnancy, but they're just undershirts that I wear under things I already have. And jeans. I had to size up my jeans from previous pregnancies. No shame. When I haven't been pregnant, I've tried collecting pieces (and now simply holding onto pieces) I can see working no matter the season and no matter my age. For me, and as most of you know, this means a lot of FLAX. I don't have the money to spend on new FLAX or many of the second-hand linen pieces you'll see circulating eBay or Etsy. (The dress/tunic above is literally the ONLY thing I have ever bought full price and new.) In fact, I'm sort of disgusted by how high the markups are. More power to the people who are reaping the rewards -- but I find most of my linen for between $5 and $25 at various thrift stores and consignment shops locally. I don't need to spend $200+ on a piece of similar value. End rant. Where was I? OK. For me, I like linen. Even in the winter months, I layer it with some cotton basics and pair with jeans. It works for me and my casual, work-from-home lifestyle. I've liked the way this style has looked since I was a teenager and went to my first Angelheart Barn Sale. It's meant to be loose-fitting. This means it accommodates my body as it changes. I'm able to wear the same sizes even when I weigh totally different weights, have different shapes, etc. It's definitely not for everyone, which I have learned when I've polled readers on different looks on my Instagram. But I'm cool with that. I've never really dressed for what's stylish in the moment. 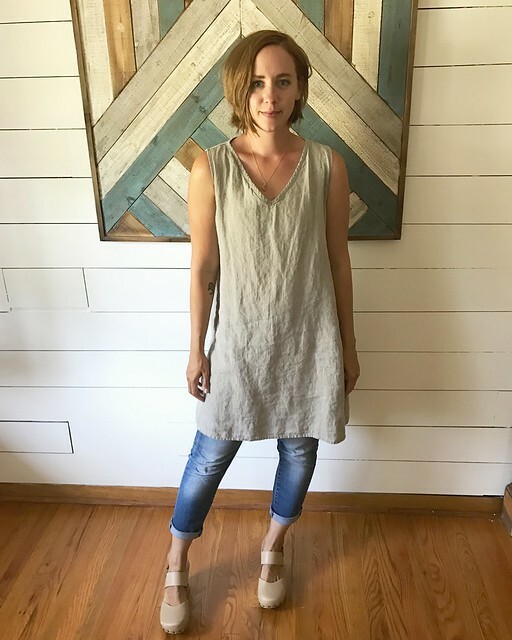 The fact that FLAX clothing has been around as long as I have shows me that it will weather trends, even if it goes out of its current rise in popularity. Right now I have all my clothing for all seasons in my closet. I have probably 60-70 things. I haven't counted, but I just know how much fits in there. Where I'm focusing my efforts on simplicity is getting rid of stuff that I haven't worn in a long while (mostly as I see them, not as a big organizing task) and not really buying more unless I find it on the cheap or it brings me joy. Because while I have stopped shopping mindlessly and regularly for clothing, if I find something I really like -- and it's $7? It may be worth it. So long as I don't do it all the time. I realize this post may not be helpful to many of you. But I'm sick of trying to cultivate a perfect minimalist or capsule wardrobe. I'm sick of it being a THING online. And I was totally trying to make it a thing, too. It's exhilarating in a way, right? BUT it wasn't s.i.m.p.l.e for me in practice. (Which is the core of my new definition of simplification.) This new system is. And I find that I don't really have too much laundry of my own to contend with. I often wear the same things week after week . . . but at least this way I have more options. I'm not a style icon. I just don't care THAT much. My kids clothing, on the other hand, is another story entirely. And I'll get to that later this week!